In 1323 the Great Lithuanian, Russian and Zhmud Prince Gedymin ordered to build a stone fortress in the Slavonic-Baltic border area among the Neman region forests and swamps. The construction of the fortress, one of the first on the territory of the Great Lithuanian Principality (the GLP), was fulfilled within 5 years. And the town arose near the huge stone building in the interstream area — between the boggy valleys of Kamenka and Lideyka. The town obtained its beautiful woman’s name from the Baltic word “lida” — a logged area, a glade. Lida on Lideyka means a glade on the Pike River. Lida took its stand on the surface without any hummock and has lived its age in the same capacity — the centre of a geographically distinct territory: povet (since 1566 г. ), uyezd, district. It is curious that the town never rose to the status of voivodeship (guberniya), as it happened to Novogrudok and Slonim. Lida has always remained a second town within the administrative unit it belonged to, were it Vilnya voivodeship, Grodno guberniya or Baranovitchy district. On the other hand, Lida has never been a mestechko, even at the time when it had only 770 residents, in 1817. It has always preserved its special status that made it stand out among the out-of-the-way provincial towns. 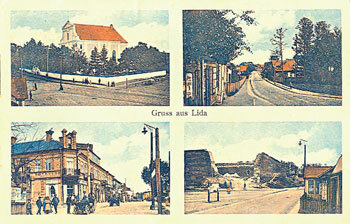 Lida saw its best years in the ХIV — ХVI centuries. At that time the town was among the leading five towns of the GLP. Lida was owned by the great princes Gedymin, Keistut, Olgerd, Yagailo and Vitovt, and also prince Koribut. From the castle walls the citizens-in-arms went to the victorious Kletsk battle and Lida gonfalon went to the battle of Grunwald. On the bank of the Lideyka in the area that for the next five centuries bore the name of Tokhtamyshev Dvor, for two years lived the cruel chagan of the Golden Horde, Tokhtamysh, who carried out a Tokhtamysh Inroad upon Moscow. Lida’s headmen were Haci-Giray — the founder of the Crimean Khanate — and Yuri Ilyinich — the constructor of Mir castle. On September 17, 1590 Lida obtained the right to self-government (Magdeburg right) and its own coat of arms. One can say that Lida was kind of a roadside inn where one could rest oneself, have a meal, shake down for the night and set forth — to Vilno, Grodno, Krakow, Warsaw, Moscow or St. Petersburg. Here came the Great Lithuanian princes and kings of Rzecz Pospolita, the Russian emperors Pavel I, Alexander I, Nikolai II, the commandant of Rzecz Pospolita Jozef Pilsudsky, the revolutionaries Dzerzhinsky, Trotsky, Markhlevsky and many other famous travellers. Since the second half of the ХIХ century there starts an intensive development of industry in Lida facilitated by the construction of the railroad Vilno-Luninets (1884). The town started growing in size and in population. Many of the enterprises in Lida that appeared in the late ХIХ — early ХХ centuries were founded by Jews — breweries (Pupko, Papirmeister), tobacco-caporal factories (Vilenchik, Rubinovich), a foundry (Shapiro), a shell case factory (Shlemovich), a printing-house (Zeldovich). Lida residents founded dozens of plants and factories, opened hundreds of trade enterprises and facilities: shops, restaurants, cafes, beer houses, hotels and workshops. In Lida the president of the Russian Academy of Art History and Criticism Petr Semyonovich Kogan, the academician Arkady Migdal, the composer Konstantin Gorsky, the writer, poet and translator Shmuel Leiba Gordon and the professors of American Universities Stepan Varshavsky and Garry Polak were born. There are also tragic dates in the history of the town. On October 7, 1891 a fire broke out at night and most of the central part of the town was destroyed — about 400 dwelling houses and 600 household buildings including the town hall. The fire completely destroyed the residential construction. Aid resources for the affected people were collected in the entire North-Western region. Thanks to the aid, during the first decade of the ХХ century the central part of the town was built up with elegant two-storied brick buildings with affluently ornamented facades. It is paradoxical that in the XХ century the government and the language of clerical correspondence in Lida changed 9 times. The changes began in 1915 when the town was invaded by the Kaiser troops and they ended in 1991 when Belarus gained independence. World War II has also left its mark on the town. During the bombing of the 22 — 23 of June 1941 the invaders destroyed the Market Square, the School Yard, a synagogue, a number of drugstores, shops, hotels, restaurants and dwelling houses. Entire streets were ruined... The liberation came on July 8, 1944. Nowadays in Lida one can see a number of monuments and a Mound of Immortality created in commemoration of the soldiers, guerrillas and underground fighters who perished during the Great Patriotic War. A number of streets bear the names of the heroes. On the sites of execution memorial complexes have been erected. In the post-war years some of the town residents moved to Poland. By the way, the future film star and Poland’s symbol of beauty of the 1970s, Pola Raksa, left Lida together with her parents (she played the role of Janek’s beloved in the famous serial “Four tank men and a dog”). Nowadays there are 290 streets in the town and 65 by-streets. The population number has remained the same 100,000 for 10 years already. Since the past centuries three outstanding historical monuments have survived — the castle dating back to the ХIV century, baroque Exaltation-of-the-Cross Catholic Church of the ХVIII century and the classical St. Mikhail Cathedral — the rotunda dating from the ХIХ century. There have also remained a number of architecturally interesting buildings in the styles of Russian Neoclassicism and Constructivism, some catholic and orthodox cemeteries with art gravestones. To the money collected by Lida residents the monuments to Adam Mitskevich and Francisk Skorina have been built. And on the square near the castle an equestrian monument to the town’s founder, the Great Prince Gedymin, is to be built.